The orbiter Atlantis holds the Magellan spacecraft in its payload bay. 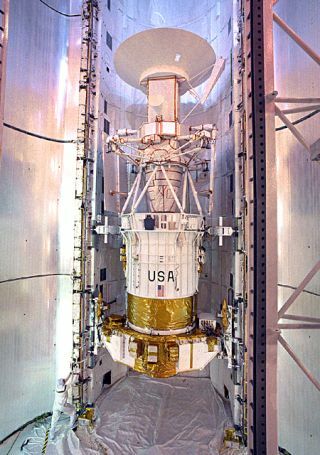 In this historic photo from the U.S. space agency, the Magellan spacecraft with its attached Inertial Upper Stage booster is in the orbiter Atlantis payload bay on April 25, 1989, prior to closure of the doors at T-3 days to launch from pad 39B. Launch of Magellan and Space Shuttle Mission STS-30 is targeted for Friday, April 28, 1989. The 23 minute launch window opens at 2:24 p.m.